Superb new single from beloved Australian notables features three new songs to tide you over until the band's ensuing full length next spring. 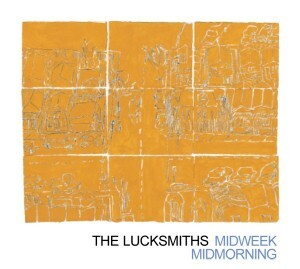 Lead track "Midweek Midmorning" is a fantastic pop affair that mines similar themes to previous Lucksmiths hits: sunshine, laziness and unemployment. With jangling guitars, trumpet, tambourine and excellent vocals, the song will surely provide the next entry in your favorite Lucksmiths songbook. The single also includes two great non-album tracks: "Point Being" is a catchy affair with handclaps and tambourines and a prominent bass line, while "Requiem for the Punters Club" completes the EP with an earnest tale about the closing of the band's favorite hometown purveyor of adult beverages - a lovely remembrance that builds to a wonderful sing-along chorus before concluding with the solitude of a wailing harmonica. Good stuff indeed. Since I 'retired' from writing my fanzine every now and again a gem of a song would come to my attention and I'd think I would definitely have to write some words about it so maybe some other people would fall in love with it too, well this is one of them.....I know this record has been out for some time now but maybe there are still some folks in the world who have yet to have the pleasure of falling hook, line and sinker for the Lucksmiths ""requiem for the punters club" on Matinée. If your one of those poor unfortunate souls please think of this as a gentle push and shove in the direction of a love at first sight. I had heard some of the bands earlier released stuff on Matinée and if anyone was to tie me up and force me to pick one I would have to admit that the Lucksmiths were probably my favourite band on the label. The songs I had already heard brought images of singing on porches under dusty Australian sunsets into my mind the same way songs by the Sugargliders used to, I guess it's the sound of those gorgeous acoustic guitars and the way they sound so laidback, even on the faster songs. Well "requiem for the punters club" is like that too, starting kinda slowly with a tune that I actually remember wanting to sing the very first time I heard it even though I didn't have a clue what to sing. Sometimes I wish I could play harmonica especially something as sad and yearning as the harmonica solo in the middle of this . For me though the greatest part of the song is saved for the end where everyone joins in for a one of those inspirational singalongs, you know the type I mean? --This Almighty Pop!